There are entrepreneurs and then there’s Steve Jobs. The man with the vision. Born in San Francisco, Jobs dropped from college, worked for Atari and went on a long trip to India before he and Steve Wozniak created Apple Computer in his garage in Los Altos. Forty years later, Apple became the first U.S. company to be valued at over $700 billion and is the world’s largest information technology company by revenue. Products like the Mac, iPod, iPhone, iPad or MacBook are now a part of the daily lives of hundreds of millions of people. And the man behind all of these is Steve Jobs. Often involved in controversies around his leadership and business practices, Steve Jobs is also acclaimed for his vision and the way Apple managed to create innovative products that people absolutely loved during his time in charge with the company. Besides Apple, Jobs also had several other business ventures. After his resignation from Apple in 1985 he founded NeXT Inc., a company that first built computers and then went into software development. It was acquired by Apple in 1997 and its framework was later integrated into the Apple Store. In 1986, he also invested in a computer graphics company that would later be called Pixar and acquired by Disney in 2006 for $7.4 billion. This deal made Jobs the largest single shareholder of Disney. Throughout his life, Jobs did a lot of reading. After his return from India, he said that the room he was living in only had a sleeping bag, a mat, a candle and a book. 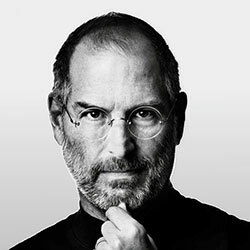 There are also a number of books written about his life and his business philosophy, perhaps the most famous one being Walter Isaacson’s Steve Jobs.